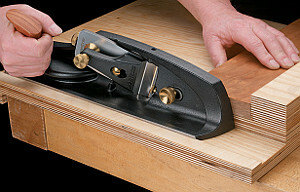 A Shooting Plane ist used in a shooting board for trimming and squaring up the edges (jointing) and ends (end grain) of boards. The mass of this plane, combined with its long base and low center of gravity, makes it both stable and effective. At 3.5 kg (7-3/4 lb) and just about 400 mm (16 inch) long, it is a substantial plane; you will appreciate the authority it provides when shooting. 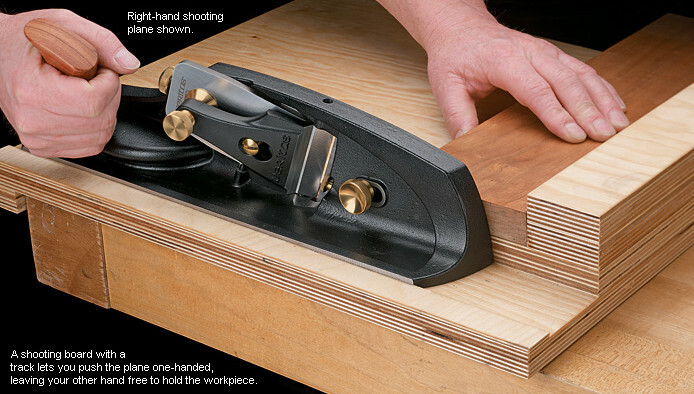 The body is fully stress-relieved, ductile cast iron, with a sole and running surface machined flat and square to one another; the 54 mm (2-1/8 inch) wide running surface fits the classic Stanley #52 chute board. Three set screws let you compensate for slight inaccuracies in a wooden shooting board by adjusting the blade square to the workpiece. Loosening a brass locking knob allows you to adjust the mouth opening, while a stop-screw retains mouth settings and prevents contact between the blade and movable toe. You can set the adjustable rear tote at a comfortable angle for use with the sole upright or facing down. A bevel-up plane, it has a bed skewed 20° to reduce cut resistance and make a shearing cut that leaves a clean finish on end grain. Combined with the 12° bed angle and 25° blade bevel, this yields an effective cutting angle of 35°. Includes a lapped blade, made of either O1 or PM-V11 tool steel, which offers the best performance at low bevel angles. It uses the same 57 mm (2-1/4 inch) wide blades as the other Veritas bevel-up planes. 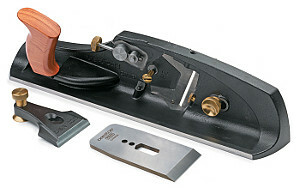 A Norris-style mechanism combines feed and lateral adjustments for easy, precise blade setting. Available in right- and left-handed versions. This item we ship only within the European Union! 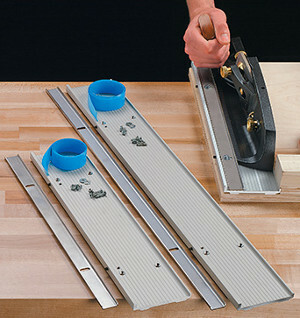 These are straight, durable aluminum tracks for making your own shooting board. They fit the Veritas shooting plane and shooting sander, and any other plane with a running surface between 2-1/32 inch (52 mm) and 2-1/4 inch (57 mm) wide; you can adjust the stainless-steel outer rail for a perfect fit. Set screws keep the rail from shifting in use. The inner rail is 11/64 inch (4.4 mm) tall. 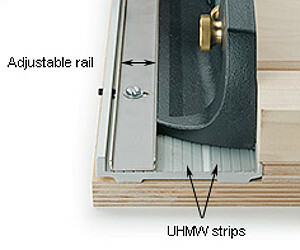 Low-friction UHMW strips in the bottom of the track let the plane glide smoothly. Screws for mounting the track to a shooting board are included. The 16 inch (406 mm) track provides ample travel for most end-grain shooting. 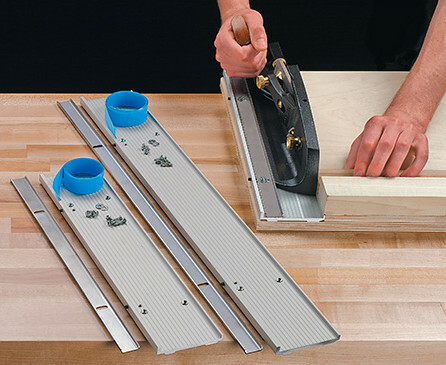 The extra length of the 24 inch (610 mm) track is useful for jointing work or making a two-sided miter shooting board that lets you handle any grain orientation. Plane and shooting board not included!